At this point it's practically cliche to note how hard the recession hit post-industrial America, and Detroit is the poster child for this particular type of economic decline. It's hard to look (and to look away) from some of the poetically beautiful images of decay that have been documented in this once bustling city. One of my favorite comedians, Eugene Mirman, has even joked that bears will be the ones to gentrify Detroit. But it's not all doom and gloom in the Motor City. New initiatives utilizing the arts to revitalize the city are gaining traction, especially thanks to funding from creative placemaking consortium ArtPlace (our theme for the month of October). ArtPlace believes so strongly in the potential of art to revitalize Detroit that the city was the only funded location that received three grants from the consortium, totalling over $1 million. Read on to find out the who, why and how of ArtPlace in Detroit. "A major force of positive change"
All three ArtPlace grants in Detroit are centered in one area, the Sugar Hill Arts District in the neighborhood of Midtown. One of ArtPlace's objectives is to fund projects that already enjoy local support and funding, rather than building from the ground up, and the Sugar Hill projects are no exception. One of the grantees, the Museum of Contemporary Art Detroit (MOCAD), has been a presence, even an anchor, in the Arts District for the last five years. According to their ArtPlace page, "[MOCAD's] entire facility exists as much more than a mere building...we aim to empower the community by connecting them to the best of national and international art and by presenting a broad and eclectic selection of public programs." It goes on to say that this ArtPlace funding "will not only benefit the city but will contribute to its growing visibility as a place where art lives and is a major force of positive change." ArtSpace is also investing in projects in Sugar Hill that are still in the developing stages. Nonprofit planning and developing company Midtown Detroit earned a grant to purchase and renovate a 1915 Late Gothic Revival church located in the boundaries of the Arts District. Though it's not entirely clear how the space will be used (a feasibility study and more information are on the way), there is interest in creating a music venue--a perfect compliment to MOCAD and a terrific way to hearken back to the neighborhood's artistic roots as a jazz hotspot through the 1960s. "This is about the intersection of art in the real world, people’s real lives. And I don’t think you can talk about renewal in Detroit without talking about Woodward Avenue [the main thoroughfare of the Arts District], and I don’t think you can talk about Woodward Avenue without talking about the arts." The above projects are exciting, and it's easy to envision how they will help revitalize this area, as cultural organizations have done everywhere from Milwaukee to Bilbao. But Detroit's most exciting ArtPlace grantee, in my opinion, is the Detroit FAB Lab. The FAB Lab, modeled after others that exist in the US and around the world (such Brooklyn's 3rd Ward), will be a community workspace for industrial and traditional arts as well as startup businesses. Artists will have access to technology such as 3-D printers and more traditional artistic amenities. Aside from a place to set up shop, businesses will have access to services any startup would appreciate- coaching, networking, mentoring, and the like. The Lab will also be closely affiliated with TechTown, an already existing entreprenurial community at Wayne State University. This affiliation will provide the FAB Lab with access to the University's resources, physical and otherwise. Bottom line? The Detroit FAB Lab will provide the area with "a cooperative working and social environment that will foster innovation" for both artists and entrepreneurs. The Detroit FAB Lab's team is quick to point out the connection between their own mission and the history of Detroit as "a place where things are made." I think that's why I find this project most exciting - though it is based on the Fab Lab model that exists around the US and the world, this Fab Lab feels very specific to Detroit. The intersection of art and industry is especially key to its local relevance. In Detroit's heyday, art and industry (automobiles) were the city's two major exports. What art, you say? Motown, of course! Back in the day Motown Records was a major economic and cultural force in Detroit. The music may be a popular art form, but Motown's quality and staying power over the decades are inarguable. Hopefully ArtPlace's "all about the local" strategy will ensure that art can be a reinvigorating force in the Motor City in the 21st century, the same way it was for Detroit in the mid-20th century. 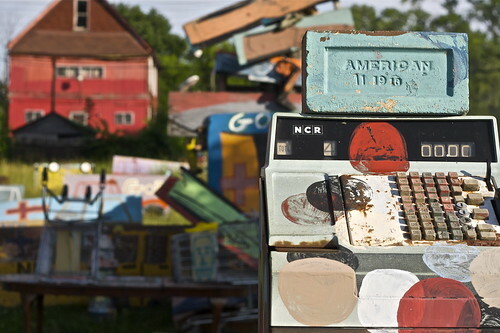 Have seen what the arts are doing in Detroit first-hand? Are you a Detroit native with thoughts about how ArtPlace will impact Midtown and the city at large? Tell me all about it in the comments! PS: For images of hope from Detroit, check out the Can't Forget the Motor City photography project, which was created in response to many outside photographers documenting decline ruin in Detroit. I've been visiting your blog for a few weeks now and just wanted to thank you for writing such fantastic content. I'm a formal arts advocate in Oklahoma City and your site is just invaluable.